“War,” say the realists, is the “continuation of politics by other means.” But of course war—whether symbolic or actual, whether fought with bullets or with words—is also arguably the last resort of the incompetent; a means of managing power when all other manner of negotiations have been frustrated and exhausted. War, of course, inevitably leaves carnage in its wake, whether it is fought on a literal battlefield or in a legislative chamber. And so rather than to concede the purportedly “essential truth” of the realist mantra and all that it portends we should perhaps consider the possibility that the political process operates best when it dances to a different drummer. “Dance” is not an idle metaphor here, for it calls attention to the artistic and ritualistic quality of politics. Politicians, after all, are courtiers, and whether they are courting votes from their constituencies or courting an opposition with which they must co-exit, they are engaged in an important ritual of cooperation. I submit that this is important in almost any political system, but that it is especially so in a democratic polity where the very legitimacy of the process relies on the mutual commitment of any opposition to a common cause that supersedes any particular outcome. Rituals of cooperation that underscore civic friendship, whether feigned or not, prefigure the grounds on which the dance of political compromise might precede. And so we come to the photograph above which appeared in numerous publications this past week, both in print and on-line. 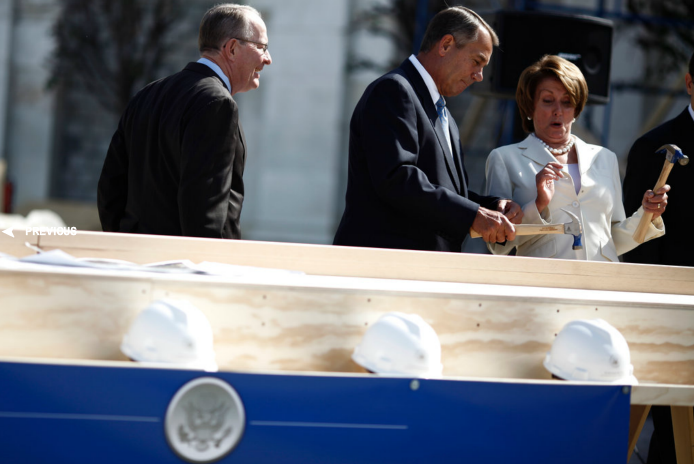 Representatives John Boehner and Nancy Pelosi, the Majority and Minority leaders of the House of Representatives respectively, ritualistically cooperate in the building of the platform on which the winner of the November election will be inaugurated in the new year. Of course, it is perhaps one of the few places at which they have cooperated at anything over the past four years, and so one might read the image as cynical political theater. 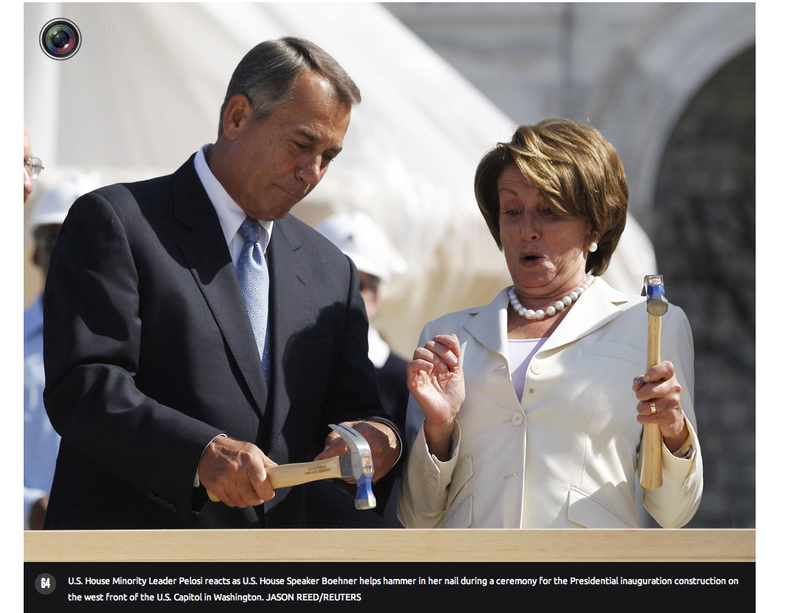 We should not ignore that possibility too quickly, and truth to tell the photograph was cropped in some publications so as to focus tightly on Boehner and Pelosi and the somewhat surprised look on her face in a manner that cast the scene as one of awkward discomfiture. But rituals need to be seen against a broader horizon of activity and interaction, situated in a context that locates the performance in a symbolic history of repetition that underscores their longevity and normative significance. That is why I like this image shot from below and with a wider angle that takes in an emblematic representation of the presidential seal, a reminder that the inauguration platform–which here, and importantly, is a work in progress–is the physical site of a formal ritual that presumes to stand above party in the name of a united “people. ” The photograph also features the smiling and interested Senator Lamar Alexander as he observes the ritual, and he appears to do so approvingly. Senator Alexander is not only from a different legislative body, but more to the point, he is one of the more bi-partisan members of the U.S. Congress. A member of the Republican party, and one time candidate for his party’s nomination to the presidency, he nevertheless breaks ranks when conscience and good sense tell him that it is the prudent thing to do. Of course, such bi-partisanship is hard to find in Washington these days, but perhaps the simple staging of this event for the photographer’s lens—itself a political ritual—is a small sign that even those who have failed to cooperate in recent times recognize the need to keep the longer, historical possibility alive.